What a beautiful dress, you look exceptionally stunning in it. Gorgeous! I’ve had a few challenges when working with velvet too – – I kept losing pins in the thick pile :). The lining is beautiful and the color is well worth the effort you went through to dye the cloth. Stunning. You need someone to take you out on the town so that you can show that dress off! This dress is positively gorgeous-you look amazing! What a beautiful dress! The fit looks perfect. Beautifully done! It looks incredible on you too! 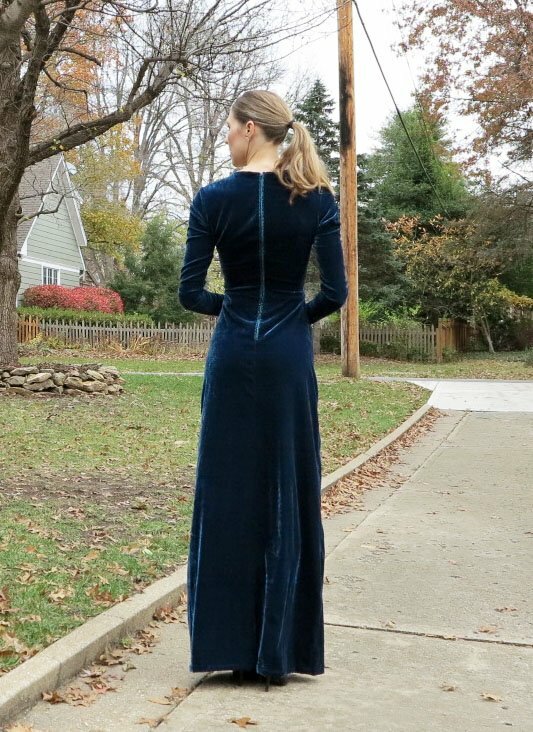 I am about to dive into some velvet for a dress for myself tomorrow, and I never have worked with it before. I am glad to see you did it without incident! That dress looks gorgeous on you! 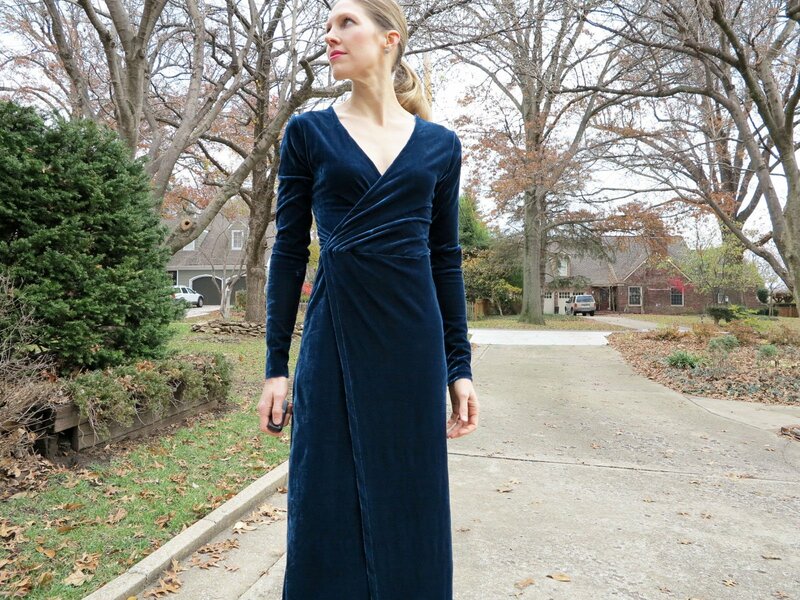 I just ordered some burnt orange silk/viscose velvet so you’re advice comes in very handy! Wow!!!! Stunning. I love everything about this dress. The colour is so beautiful – well done. What a stunning shape Debbie – a beautiful showcase for your fabric (oh and that color looks like it worked perfectly!). Is this dress one of your own designs? You look ready to walk a red carpet! Yes it is my own design, via a bit of draping and working from a few existing blocks. I love it! The shape of the dress is really nice and I love that you made it as a maxi dress. 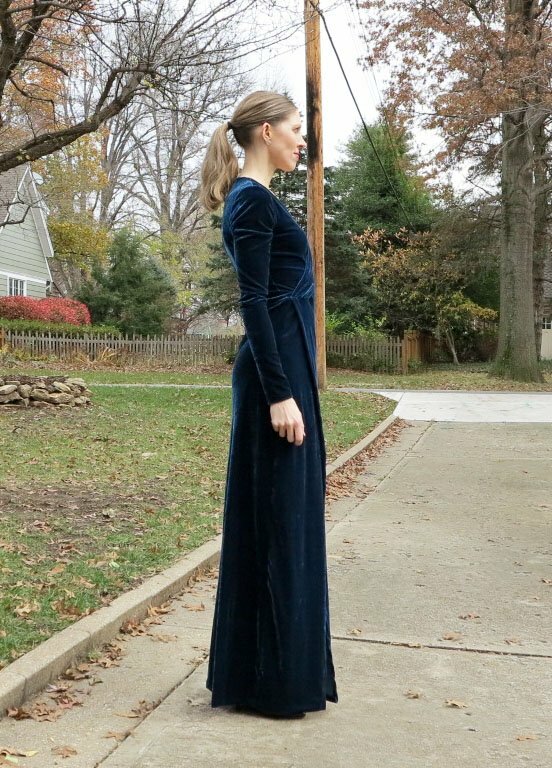 Velvet is so trendy this season as well! Must get some project going too! Wow Debbie, this dress is stunning! I love all the care you took with this project, from dyeing the velvet to all the hand stitching to the gorgeous beading along the zipper. I just love everything about it. I hope you find some wonderful occasions to wear this dress. You have to show off all your hard work! Beautiful! I hope you have a fantastic event to show it off at! yumalicious spectacular jawdropping. and that zipper detail! i demand an update when the spring clip arrives! Love the dress, beautiful colour, fit and I dig the fabric weight! It’s amazing Debbie and I hope you have lots of lovely winter events to wear it to! What an incredible dress! Did you draft the pattern…or can I find it somewhere? Thank you Shannon! I drafted and draped this pattern myself. But I’m sure I saw something similar out there recently from Simplicity or Mccalls etc. If I come across it again, I’ll let you know. Very elegant dress and you look fantastic in it. What a beautiful dress! 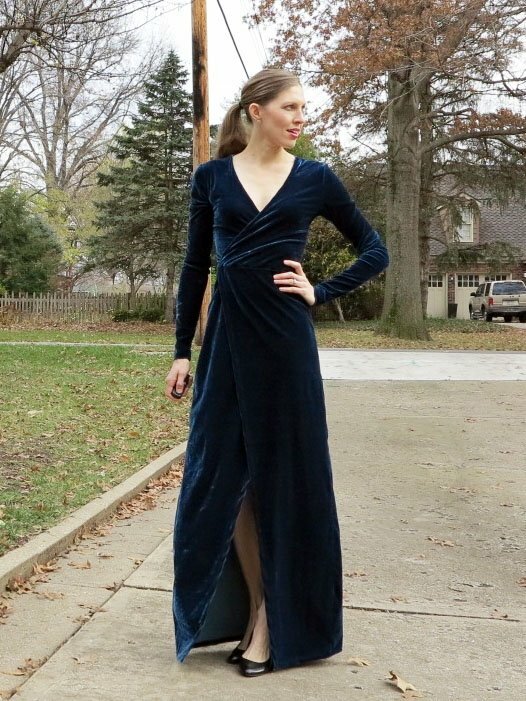 I love velvet but also find it hard to fit in my wardrobe. But perhaps… The colour is stunning on you!